Be the first to share your favorite memory, photo or story of Winifred "Lynn". This memorial page is dedicated for family, friends and future generations to celebrate the life of their loved one. Hansen, Nebraska resident Winifred “Lynn” Barrows, 94, passed away Friday, January 11, 2019. Private graveside services are to be held at Greenwood Cemetery. DeWitt Funeral Home and Cremation Service is handling arrangements. 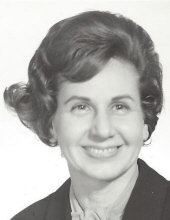 Winifred “Lynn” Barrows was born in Wisconsin on April 15, 1924. She grew up in Phoenix, Arizona, married Gib Barrows in 1944 and they made their home in Manila, Philippine Islands; Hong Kong; Hawaii; California and New York. They retired to Hansen, Nebraska in 1981. Lynn was preceded in death by her husband, Gib and son, Skip. She is survived by her sons, Andy and Greg. To send flowers or a remembrance gift to the family of Winifred "Lynn" Barrows, please visit our Tribute Store. "Email Address" would like to share the life celebration of Winifred "Lynn" Barrows. Click on the "link" to go to share a favorite memory or leave a condolence message for the family.